The first official trailer of Mehrunnisa V lub you has been making ripples across the country. It is very well received and has much increased the anticipation for this mega release. Its song Bailiya has fast become one of the most popular numbers of 2017, even though it’s quite new. Team Mehrunnisa V lub you has been aggressively promoting their movie ahead of its release and are a delight to watch every time they appear on screen. 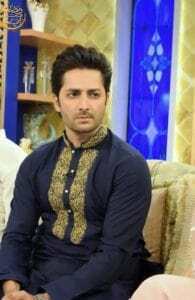 Recently, they were Sadia Imam’s guests in Aaj Tv Iftar Show, where they talked about their experiences in the making of this film and their high expectations about its success. The whole team was looking fabulous but Danish Taimoor and Sana Javed stole the show with their gorgeousness. Sana was looking refreshingly different with her tied hair. Here are some glimpses into their iftar with Sadia Imam.